At the end of February, there were a few significant snow events in Langley City. One of the things that I noticed was that there were bike tracks left in the snow as it was falling. While looking at tire tracks in the snow is not a scientific way of measuring cycling lane usage, it provided me with some semi-permanent evidence of their use, even when the weather is unpleasant. Fresh tracks on 203 Street in February. Select image to enlarge. Fresh tracks on 53 Avenue in February. Select image to enlarge. Earlier this week, the weather was warm and sunny. I take transit between home and work during the week; 203 Street and 53 Avenue are on my walking route to transit. I noticed along these corridors an increase in people walking, cycling, and scootering in the nice weather. Just a few years ago, these corridors were not very friendly for active modes of transportation. In fact, I used to avoid 203 Street due to its narrow sidewalks. Strava is a social network and activity tracker used by many people who run and cycle. Strava has been in the news recently because they provide a publicly available map which shows popular routes of its users. Unfortunately, it led to some unintended disclosures of military bases. I looked at this map years ago, but I didn’t think about it much again until the recent new stories. I decided to take a look at the map around Langley City. 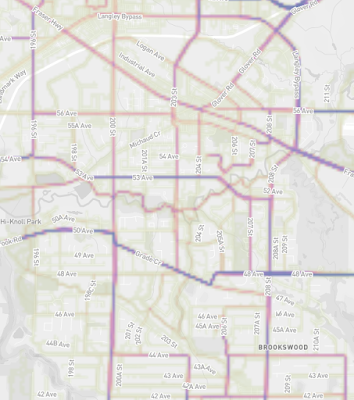 Strava heatmap of popular cycling routes in Langley City. Select map to enlarge. The map looks at two years worth of data, and is updated monthly. It is certainly not surprising that direct routes around our community such as 53 Avenue are the most popular. What is really interesting to see is cycling usage by Strava users on Grade Crescent, jutting down to 48 Avenue. 48 Avenue received bike lanes a few years back. Strava makes more detailed information available to local governments than is publicly available online. 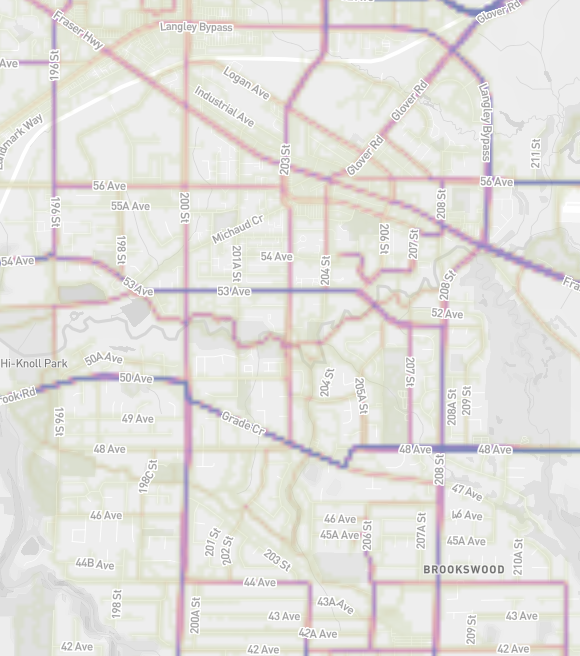 While tire tracks in the snow and Strava maps don’t paint the full picture of everyone who walks and cycles, it provides some insight into popular routes in communities.